Advertising, materialism and consumption are central aspects of contemporary Western culture. 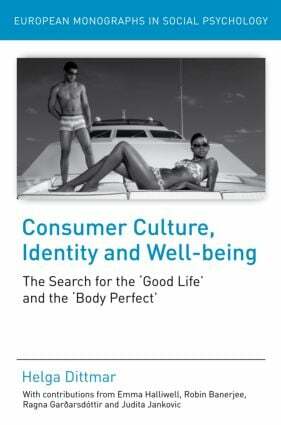 We are bombarded with idealised images of the perfect body, desirable consumer goods, and affluent lifestyles, yet psychology is only just beginning to take account of the profound influence these consumer culture ideals have on individuals’ sense of identity and worth. the unrealistic socio-cultural beauty ideals embodied by idealized models. Throughout, different approaches from social psychology are integrated, such as self-completion, self-discrepancy and value theory, to create a comprehensive theoretical framework for understanding the impact of internalising core consumer culture ideals on how individuals see themselves and the implications this has for their psychological and physical health. This book is of interest to anybody who wants to find out more about the psychological effects of living in modern consumer societies on children, adolescents, and adults. More specifically, it will be of interest to students and researchers in social psychology, sociology, media studies, communication and other social sciences, as well as to psychologists, health workers, and practitioners interested in the topics of identity, consumption pathologies, body image, and body-related behaviours.